Your mother would be happy with a hand-drawn card, but why not surprise her with our customized tin? 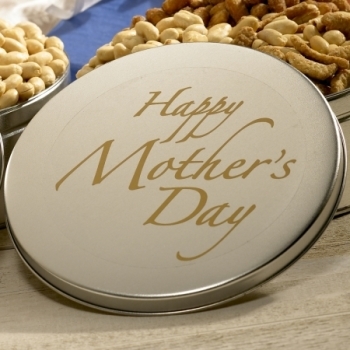 Our standard Mother's Day Tin is filled with our award-winning Peanut Brittle, our sweet and salty Honey Roasted Peanuts, and our tasty Goobers & Stix, it's the perfect gift for your mom. Our Mother's Day Classic Tin contains our all natural cheese straws. These Classic Cheese Straws are a blend of sharp cheddar cheese, butter, and a smidgen of cayenne. The Mother's Day Hot Tin contains our all natural hot cheese straws. The Hot Cheese Straws are a blend of sharp cheddar cheese, butter, and a dash of cayenne, red pepper, and black pepper. Husband & I did not like the cheese straws flavor or texture. Hot jalapeno is ok.
All items were very good. First time I ordered p-crunch, I liked it. Bought two of these, one for work and one for home. Loved the sugarcoated peanuts, peanut brittle but the big hit was the sesame sticks and blistered peanuts.......wish they were able to be bought by itself. Had no idea what to get my mother, then an email with a mother's day tin, great idea, she loved it !! Tell Bill very disappointed in tin. Opened it up too see 2 bags of foil .. Not a very nice present and didn't show that on the web.. Owner Response:Sorry to hear you didn't like the packaging. We'll be in touch.